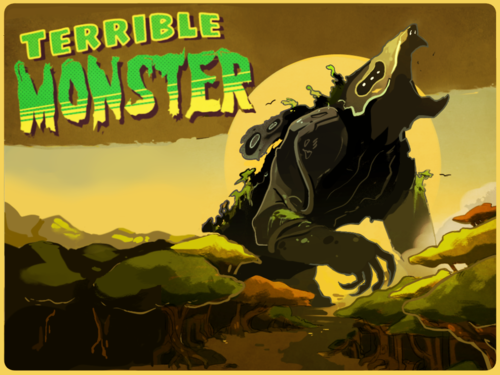 Terrible Monster is a neat little battling card microgame. With a miniscule deck of only 16 cards, the two players battle against each other in a fast and furious game. The game starts with the entire deck being shuffled. Each player gets a starting hand of 5 cards. The rest of the deck (all 6 cards) are left facedown on the table. Each player gets 4 life points and 2 Counter tokens to use. There are two additional Counter tokens placed next to the deck. When you play a card, you announce it to the opponent. In your first games, you will likely have to read the card’s effect – but after a few games, you will simply be able to name the card. There are two different types of cards. 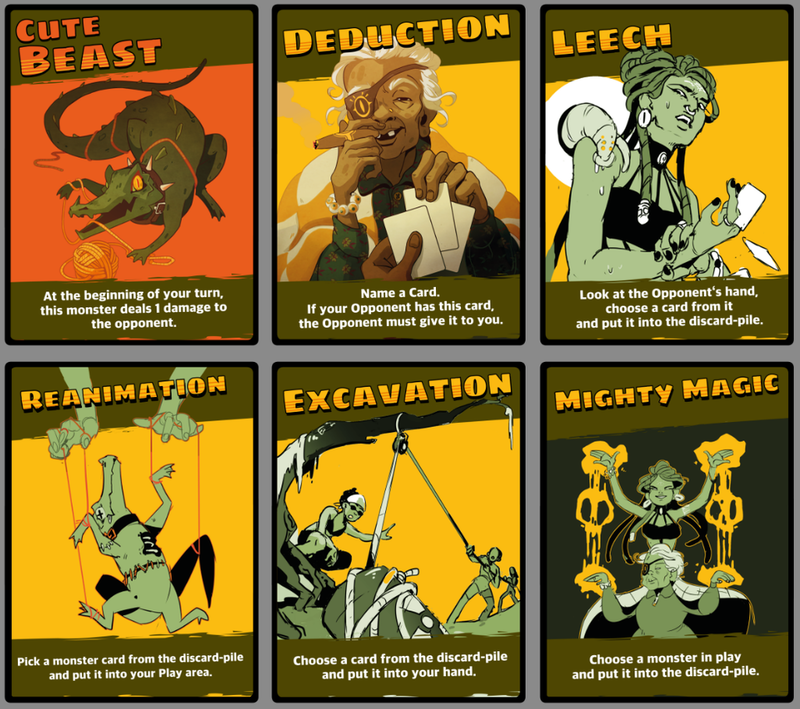 If it is a MONSTER card, the card comes to life and is played on the table in front of you. If it is a SPELL card, the card’s takes effect immediately and then it is discarded. However, as you read the name of the card, your opponent has a chance to play a counter token. If he plays a counter token, you must discard the card you were about to play UNLESS you choose to Counter Break – you play 2 Counter tokens to negate your opponent’s token. All played tokens are discarded. The game goes back and forth until you someone runs out of life points. In the case that the deck is empty, the discard pile is shuffled to form a new draw deck. The game is surprisingly deep for only having 16 cards. 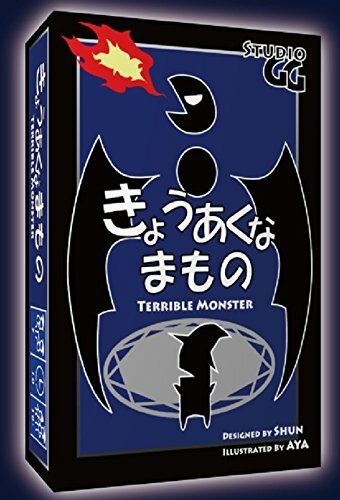 There are three monster cards in the game (one of which cannot even be played directly from your hand) and 13 spell cards. Some of the cards do direct damage while there is one monster which can reflect two points of damage. You can manipulate the discard pile – either sending cards there or digging through it to find the card that you need. In the end, there are not many ways to actually hit your opponent. The Needle Strike spell does an instant 2 points. The Cute Beast does one point of damage at the start of each of your turns AFTER you play it. And, of course, the Terrible Monster does a full four points of damage at the start of your next turn – but again, you can’t play this directly from your hand…. You have to use one of the three different ways to get it into your play area. What makes the game even more challenging is the whole Counter system. You have to be on your toes and know when to use the tokens. Stopping an attack at a crucial moment can keep you in the game. Alternatively, you sometimes have to wait until you can double attack your opponent to run them out of counter chips with the first play in order to let the second get through! This was available earlier in a Japanese version, but it has recently been re-done with awesome new art in a Kickstarter project. I am interested to see what the finished product will be – but as the backing price was only 5 EUR – it shouldn’t be too much to pick up if you’re interested!